more likely to earn less money as adults or to experience unemployment. As well as the personal cost, the estimated long-term cost to the economy of mental health problems is £105bn a year, according to a report published in 2016. 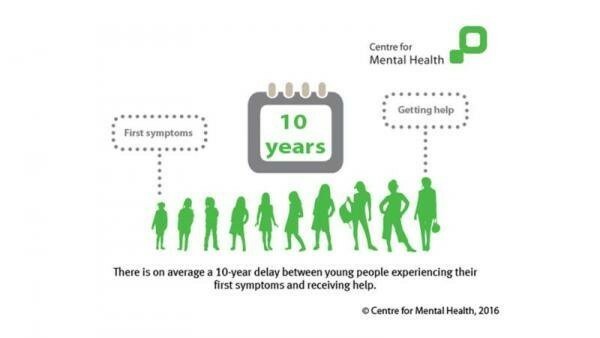 Among the many facts and figures presented were those above: there is on average a 10-year delay between young people experiencing first symptoms and receiving help! With the raft of educational change and additional financial pressures well-documented, it is important to be realistic about what a school can do within its wider community. After all, teachers are not qualified mental health professionals, and ‘diagnosing’ mental health needs won’t help anyone without appropriate pathways and provision in place. However, every child plays in the water, some dip their toe and all is good; some go for a swim but still return to shore; but some get carried away by the current. The priority has to be helping young people sooner. 8 will have experienced severe physical violence, sexual abuse/neglect (NSPCC, 2011). It has been reported that the government plans to put full-time NHS professionals in a trial 255 schools, following the Royals’ comments on the stigma surrounding mental illness. In the current climate, I think it’s sensible not to place any significant hope in such a move, but focus instead on what we as a school can do here and now with the limited resources at their disposal. 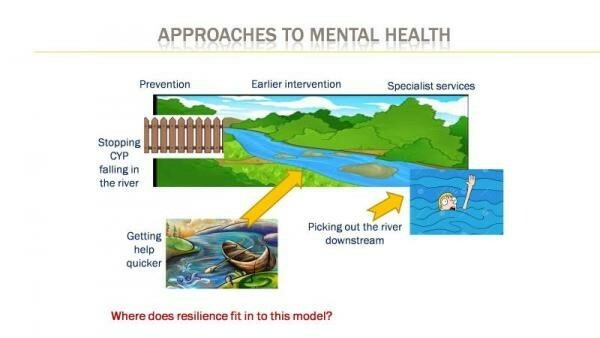 I’m very interested in the academic resilience work undertaken by YoungMinds. Their work helps schools understand how to ‘close the gap’ for the most vulnerable children and young people in your school, by exploring systems and processes to help build resilience for all pupils. What do we do at KSA to help our students? At KSA we have at least one trusted adult to whom pupils have regular access over time. Staff ensure that vulnerable pupils access activities, hobbies and sports. Young people are encouraged to map out a sense of future (hope and aspirations). We help pupils to manage their feelings. There are opportunities for young people to support each other through volunteering. We are also going to introduce peer mentoring in the new year. We provide opportunities for pupils, staff and parents to understand resilience and how it might be developed throughout the school community. have good relationships with others, because they are caring, flexible, can understand others’ feelings and can laugh at themselves. are independent, and confident that they can get things done. have a sense of purpose and hope for the future. feel that they are worthwhile and can make a difference. have support from their families and communities and are expected to do well. The average life expectancy of men is four years less than that of women. 2,209 men were diagnosed with testicular cancer in 2009. These are just two facts on men’s health from the MOVEMBER website, the internet home of one of the fastest growing men’s charities in the world. The fund-raising technique of this unique charity is to engage men to grow moustaches, in return for being sponsored and then donating that money to charity. I was so impressed to see students engaging with this charity and championing our staff in growing their moustaches. Our annual Open Evening for parents of students who are currently in Year 6 in our local primary schools and who will be making a decision about which secondary school they want to attend in September 2019 kicked off last week. Recently, the Senior Leadership Team have visited many of the students in their current schools in order to talk to them about this process and how it might be that KSA is a good fit for them. I have been keen to express that our amazing school is only one of a number of possible choices for them and that it is essential for them to go to as many Open Evenings as they can to help them make their final decision. KSA, however, we have pointed out to primary school students and I pointed out again on Tuesday evening, is a bit different to everywhere else. What we haven’t got is perhaps to some more immediately obvious than what we have got and from the outside some have even suggested that the smaller size of our building makes us look less like a supersized secondary school. One of our key strengths is the positive feeling of warmth that is experienced each day in our intentionally small school, where our ethos allows us to offer personalised learning experiences to our students, all of whom are known as individuals by our teachers. Our teachers themselves are almost all (myself included, I spent 17 years in secondary schools in different parts of the London before choosing to come to KSA!) secondary trained, and despite a teacher shortage in most schools we have still managed to have subject specialists in all curriculum areas so that first-class lessons are delivered by experts. The hugely valuable experience of our longer serving colleagues has also been used by our subject leaders to plan a coherent curriculum that joins all of the dots from KS2 to KS5, with our current Year 11 GCSE students seamlessly accessing learning that builds upon rather than dismisses (as some secondary schools still do!) the outstanding progress that has come before it. We expect great things from our students and we are confident that the two year trend of excellent grades will continue to reflect the incredibly meticulous planning of the teachers and the hard work that our young people put in. But, of course, as I have explained to the many students that I have spoken to so far during my visits to primary schools, I’m bound to say good things about the school where I am Headteacher, so it’s important that I can also prove that other people have also said positive things about us. There are many examples of external praise about KSA. You just have to scan our Ofsted report to see that when inspectors visited us in September 2017 and gave us a good grade, they were bowled over by our students’ positive attitudes to their learning and that they were happy at the school. KSA really is the distinctive school that I claim it to be in this blog. I have worked in four other schools before coming to KSA and this is the one that stands out the most for punching above its weight and offering something special to its community. In many bigger schools, you just don’t get the personalisation of learning that can be found in KSA each day, with many students going almost the entire length of a secondary school career without their teachers knowing who they are. There are so many aspects of life at KSA that are unique, our clear ethos and the commitment of our teachers, to name but some, that our students leave us at the end of Year 11 more equipped for the next stages of their lives than they would ever be if they were simply numbers on a spreadsheet somewhere else. In fact, so many of them have decided to stay on with us in our new Sixth Form. It’s a big choice for families to make over the next few weeks about where their sons and daughters go to next September, but it doesn’t need to be a big school that they go to. Whatever choice is made about the secondary school that comes next for them, it must feel right, and to this end I would urge anyone who is interested in finding out even more about our brilliant school to either come to come and visit us for a personal tour of our school. Over the next couple of weeks, our school councillors will be chosen, following opportunities given already to students during form times to put themselves up for election, and the first council meetings of our new academic year will take place. Our system at KSA for ensuring that our students have a voice is simple and effective. Each form group elects two representatives who will become part of the larger year council for their own year group and who will take any concerns that are raised by their peers down the appropriate channels. Although forming intelligent opinions is vital to a young person’s personal development, enabling them to be heard is often far more difficult than it should be. At KSA, we are keen to promote the idea that shouting loudly or angrily does not necessarily guarantee that people in positions of power will listen and that articulating a view in an intelligent, sensitive and timely manner is often a much more impactful way of ensuring that opinions are taken on board. It is essential that our young people learn not only that it is important to stand up for something that they believe in but also how to do this effectively. Taking part in a mature but passionate conversation is much more likely to affect change than throwing a tantrum ever will be, and through our year and student council meetings we intend to lead our students towards also understanding this point. Although I have yet to receive any so far this year, last year I received a few emails/letters from our students about issues which they believed were either unfair or which they simply thought could be improved. On each occasion, the careful manner in which the points were raised forced me to take notice and I was genuinely delighted to meet with the students affected by their concerns and reach agreements about how we could in some cases make changes and in others increase an awareness about why certain things were in place. This kind of intelligent discourse with our community is both encouraged and vital to our collective progress, and we will always listen and react to any views that are thoughtfully put across. As adults, we can often forget what it was like to be a child (I certainly can, it was such a long time ago!) and it is so important that we take the time to listen to their perspective on how our school is for them. It is, after all, because of the students who come to us every day that we actually do the jobs that we do so we need to ensure that they feel that they are a part of the KSA team. An important lesson for anyone who exists as part of a democracy, however, is that you don’t always get everything that you want and that an individual’s demands will almost always be trumped by the needs of the majority. An example of this would be that in every school that I have worked in, including KSA, at some point during a year council meeting, and sometimes even during a school council meeting, someone will raise a hand and insist that the school builds a swimming pool, a skatepark or a cinema, or that the school canteen is replaced by a Nando’s or a McDonald’s. Lessons should be shorter and fewer and break and lunch should be longer, oh, and we should also all have iPads. Part of growing up, clearly, is understanding the nature of the world that we are part of and the constraints that being part of a greater social whole must put on our individual wishes. Sometimes, however, change has indeed been affected following discussions in council meetings, such as students being able to eat and drink around allocated parts of the school site, seating areas being provided and Christmas jumpers being worn. Suggestions that are made by students who know that any implementation will benefit the whole community leave a wonderful feeling when they ultimately lead to positive change and I am excited about any ideas that may come about not only in the forthcoming council meetings but also via our constantly open channels of communication to teachers who will always listen to intelligently articulated views. This is a really important question and one that every parent, carer teacher and governor ought to join me and ask on a regular basis. It is true that some of your children are the victim of bullies. It is true that some of your children are bullies. It is also true that sometimes a child can be a bully in one part of their life and also a victim in another. As adults we have no excuse to be a bully, to harass others, to be rude, to be obscene or to be deliberately nasty. When adults behave in this way they lose their jobs, their friends, their reputation and others’ respect. But children are different. Children are works of art in progress. They are not yet finished and, like a great work of art, they have the odd smudge and the odd blemish along the way. Children are by their very nature imperfect, learning how to be kind and thoughtful as much as learning how to read and write. Every child has the capacity to be both wonderful and unpleasant; some are better than others at staying away from that dark side, but some, occasionally, bully, harass, mock, intimidate or sneer at others. Unpleasantness is not a new thing. It is as old as humanity and exists in every school and in every street. Sometimes your children don’t make you or me proud. Sometimes your children say, do, type, text, WhatsApp, Facebook or Instagram something they will regret because it hurts someone else. Sometimes your children forget what it is like to be bullied or harassed, or temporarily shake off that feeling of being bullied and harassed by making someone else feel as bad as they do. Bullies often start on what someone is wearing, or their hair-colour, or maybe their skin colour, their beliefs, accent, gender, sexuality or sometimes simply what phone they have in their pocket or the arrangement of stripes, ticks or crests on a pair of trainers. Bullies often keep going until they find the thing that hurts their intended victim. Your children are entitled to as much privacy as possible, even when they make terrible mistakes. Unlike adults, children need to be protected, even when they have become a bully so that they can reflect and reform and be the adult their parents and carers dream they will become. If your child is a victim of bullying, or you suspect he or she might be bullied, then call us or email us today! Let us show you how effective we are at ending the pain another child is inflicting on your own. If your child is a bully, or you suspect he or she might be a bully, then call us or email us today. Let us show you how effective we are at helping all young people reflect on why they treat others in this way, what impact they are having on others, explore why they are doing it and learn ways to stop making others’ lives a misery. KSA is not the building. In fact it is not the parents, carers or the staff, really. KSA School is your children. KSA is only as good as the children who go to KSA. Behaviour at KSA is only as good as your children’s behaviour. Bullying at KSA is only as bad as your children’s failure to be kind and considerate. We are proud to work at KSA School and I am proud to lead KSA School. I believe that we are a good school that can be a great school. However, let’s be clear on one thing, being a great school means being full of great kids. Those great kids need great adults around them, explaining the difference between right and wrong and teaching them how to read, write, calculate, think, reason and create in ways that would make all of us adults proud. It takes a community to educate a child. So, when your own children make their mistakes we still believe in them; even if others do not. What is independent writing? Why is getting writing right a massive challenge? I have always loved writing and I have always loved teaching writing to develop writers. On a daily basis, I see structure strips and models of what teachers want students to produce. All are really valid and important scaffolds in the development of writing. What I want to see in Year 7 and 8 is the students themselves creating their own personal toolkit for writing that they can use at school, but also at home. Stepping students beyond the scaffold is the one of the hardest things to do. So how do we encourage more independent writers at KSA? 1) We give them something interesting to write about. 2) We give them the knowledge to write about it effectively. If it’s a story, the time spent planning is key. 4) We underpin with lots of talking first, whatever the age range or ability, so that students have practiced the vocabulary, ideas and structures so they can fully understand the requirements. 5) We read really good books. Talk about really good books with them. Guided reading does not just benefit reading. Models are vital, using great models allows students to understand the flow of writing. 6) We teach grammar as a tool to improve writing, not a bolt on. Use examples when appropriate- we don’t shoehorn it in. 7) Sometimes we let them just go for it. A first draft is just that…let them splurge their ideas and get it down on paper. 8) We don’t ban words. Sometimes sad is the right word, not melancholy, not lachrymose, not distraught, just sad. What should students do at home? Practice. Rinse and repeat to revisit forms of writing they’ve done before. At 13, did you know what you wanted to be when you grew up? Possibly not, I certainly had no idea. My mum tried to get me to go into medicine because I was good at Science, but I just wasn’t interested in a career in medicine! Like all schools, we are required to provide students with impartial careers education and advice from year 8. However, we fully understand that many students still will not be sure what career pathway to take when they leave school, college or university. That is why we hold events such as our Options evening, post 16 information evening and our fabulous, ongoing career events. Around 30 different employment sectors have set up 'shop' in our school this year and shared information with parents and students about their professions and how students can best prepare themselves. At this stage in their education, students should keep their options open and have the flexibility to choose any or many career pathways. The key to successful future employment is good qualifications, skills and personal attributes. Qualifications: Most employers, colleges and universities will require students to have a grade 5 in English and Mathematics plus at least 3 other good GCSE passes. Students need to appreciate that their GCSE outcomes remain with them throughout their lives, e.g. anyone wishing to pursue a career in teaching must have the appropriate GCSE grades in Mathematics, English and Science to even get on the teaching course. Their success at KSA can be the cornerstone of their future career. Skills: The kind of skills that employers are looking for, are reflected in our KSA Learner. Personal attributes: These are what makes one candidate stand out against another either in their application or at interview. All students are expected to complete at least one hour of enrichment - this could be developing a musical talent, trying a new sport or joining a masterclass. There are lots of opportunities for students to develop themselves here at KSA. Qualification, skills and personal attributes: the keys to a successful future. Over the weekend I reflected on my own career pathway and how I ended up becoming a teacher more by chance than design. Nonetheless, making this decision in my life was easier because I had the qualifications skills and attributes but I also had the determination and passion for teaching children. I now have the best job in the world! This is what I wish that for every one of our students and I'm glad KSA will play a part in them achieving that goal.